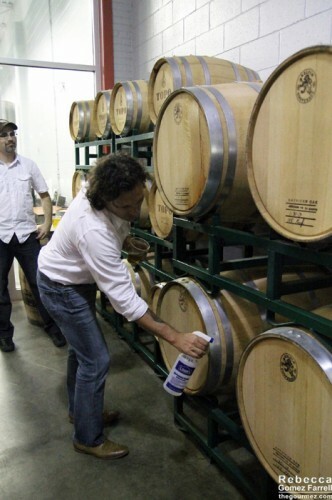 Back in the fall, I spent a few days at TOPO Distillery’s facilities as part of the Terra VITA Sustainable Classroom. It was a strange sort of torture being so close to their organic, 99.6% local (more on that later) array of spirits that includes white whiskey, vodka, and gin. 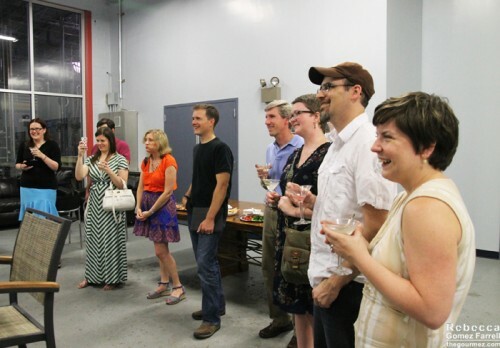 So I asked Esteban McMahan, TOPO’s spirit guide, if he wouldn’t mind hosting a tour and tasting for food bloggers in the Triangle. And he said yes! The evening started with us bloggers slowly trickling in, a few having fallen prey to the oft-made mistake of going to Top of the Hill restaurant and brewery down the road first. That restaurant provided us with some delicious appetizers. 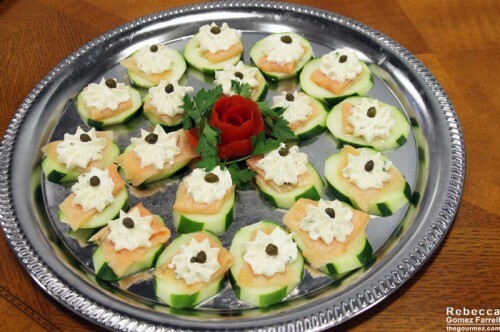 Salmon, cucumber, and herb cream cheese bites. 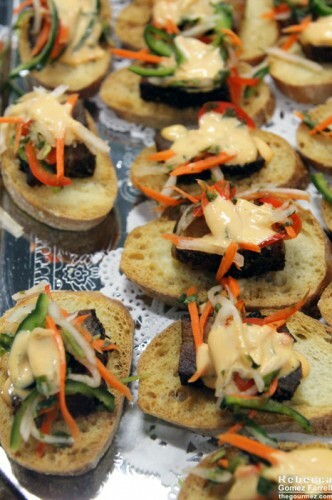 The pork banh mi on crostada was especially delicious. It’s also quite loud to crunch on when someone’s speaking. I may or may not know that from personal experience. Esteban plied us with libations featuring their spirits as we filtered in, and I loved the blueberry cocktail. 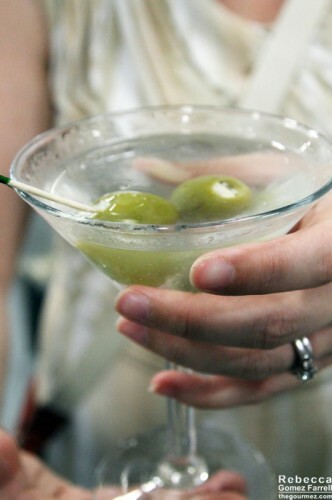 Triangle Localista gives a vesper a try. 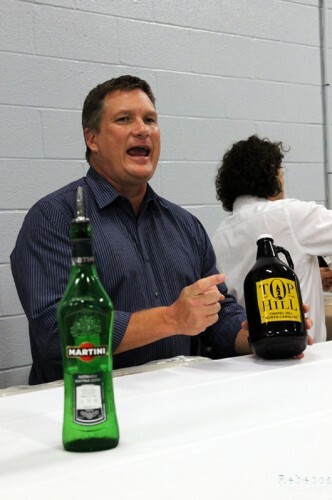 Scott Maitland, TOPO’s and Top of the Hill’s owner, filled us in the history behind his founding of TOPO, which came from looking at expanding Top of the Hill’s brewing capabilities and realizing in his research that with distilling spirits, he could make an all-local product that he can’t do with beer. Scott explaining his frustrations with growler freshness limitations. And North Carolina produces a lot of red winter wheat, which is used to make many of the finest spirits in the world. It seemed like a perfect match. 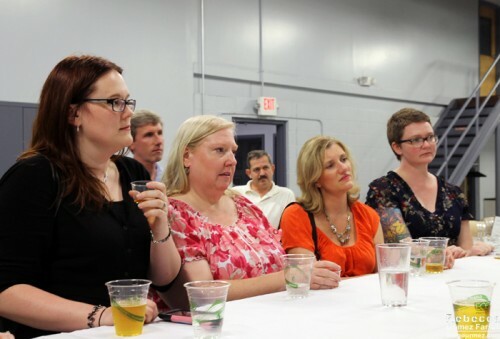 They committed to buying 75 acres of organic NC wheat in 2008, assuming they would open the distillery in 2009…and that didn’t happen according to plans. 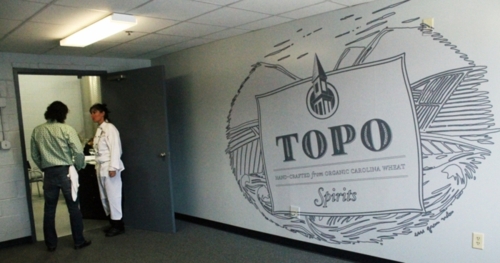 After a few years of finding the ideal spot, dealing with city regulations, and navigating the tortuous process of label approval, TOPO finally began operations in the fall of 2012, producing gin, whiskey, and vodka. Now the whiskey they sell is unaged, because they haven’t been open long enough to provide aged whiskey. 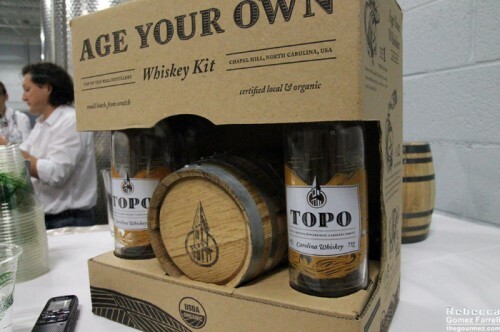 TOPO is fully aware of the flavor limitations of unaged whiskey, and they only decided to sell it after tasting the product they intended to age. They were surprised to find that it could stand up to the white whiskeys already on the market. It’s won two silver medals already, so the critics appear to agree. But to provide a means of letting their customers have the extra flavor and depth that aging provides, TOPO developed a kit for ageing their white whiskey at home. Inside the kit’s charred barrel. 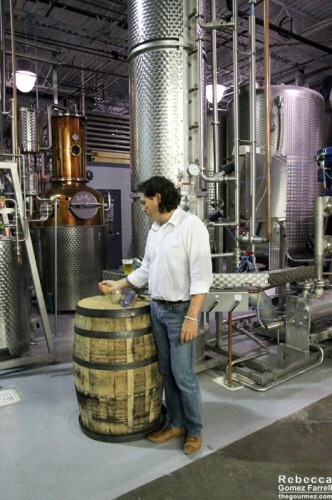 With a smaller barrel such as the one provided with the kit, the whiskey can be aged well in just three months! After learning about TOPO’s history from Scott, who has a great sense of humor about all the tribulations that come with opening a new business, Esteban took us into the distillery proper to explain the process they follow in distilling fine vodka, whiskey, and gin. I’m going to leave the explanation of the process to people much more knowledgeable in the area than I am, such as Esteban, and just give you a few pictures along the way instead. Take the tour for the full explanation (hint hint). 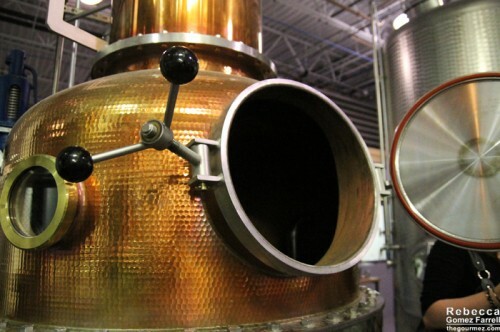 Whisky rectifier on the right and vodka rectifier on the left. 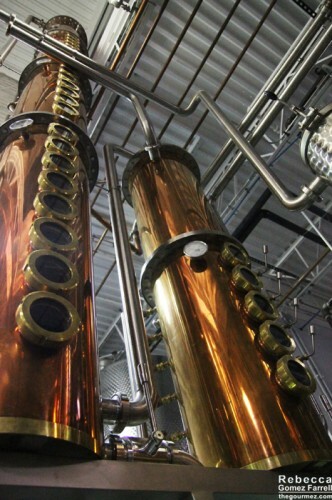 The vodka’s is much taller because it requires more distillation. 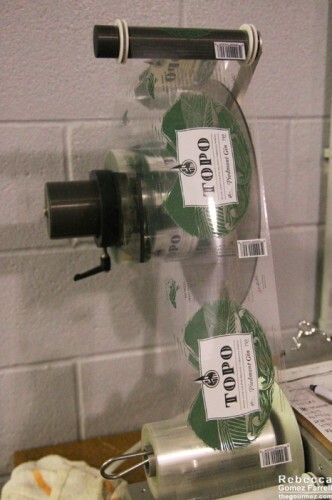 Labeler used for TOPO’s bottles. This is the gin label. We ended the tour portion of the evening by the aging whiskeys, which TOPO will be selling in the future. Esteban also talked about the angel’s share, the traditional name for the liquor that seeps out of the barrel as it contracts, cracking the wood. Another distiller taught him, after a particularly greedy angel came around, that all that’s needed to stop the seepage is a squirt bottle. The barrel reacts by swelling right back up again. Esteban illustrating this fancy technique. Finally, we ended the evening relieved to be back in the air-conditioned portion of the distillery and excited to taste test the spirits. 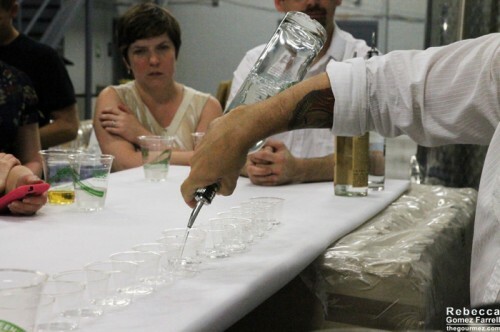 We started with the vodka, Esteban pouring us a well-known, small-batch vodka for comparison’s sake. TOPO was on the right for obvious reasons, as Esteban informed us with a smile. However, clear spirits in dixie cups don’t make for exciting photographs, so I’ll spare you those. 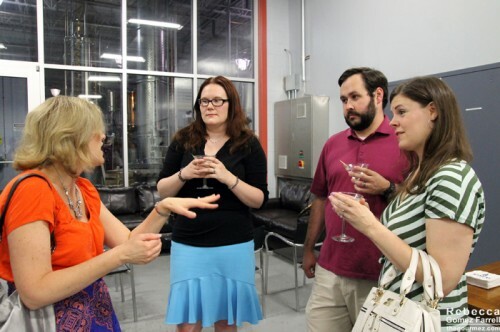 Have some bloggers ready to taste instead. Sarah Cooks the Books, Triangle Localista, Hines Sight Blog, DorkyGirl/Nutella is Evil. The vodka tasting was rather interesting, most of us finding a clear difference while sniffing and drinking the two samples. I thought TOPO’s vodka was surprisingly floral, and buttercream was a common note tasted as well. 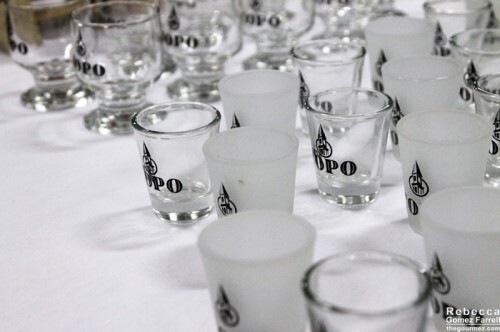 Esteban explained that part of the difference in flavors comes from TOPO using less charcoal-filtering than other distillers, choosing to preserve the vodka’s natural flavors and sweeteners rather than strip them out. Action shots of pouring shots! Now back to that 99.6% local claim. 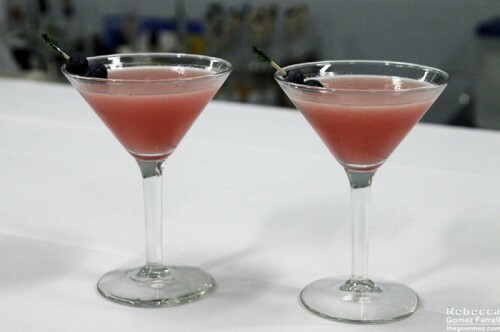 The one item TOPO uses that they can’t get produced in North Carolina is organic juniper berries, used in most gins. They also use lemon peel, star anise, cinnamon, cardamom, and several other ingredients, some of which are kept secret. Esteban confirmed that MSG is not one of those, to our amusement. 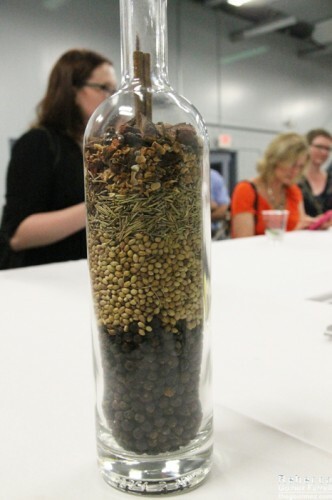 Breakdown of botanicals used in TOPO’s gin. Esteban explained that gin doesn’t have the same precise alcohol content requirements that whiskey and vodka do, so the alcohol amounts vary. 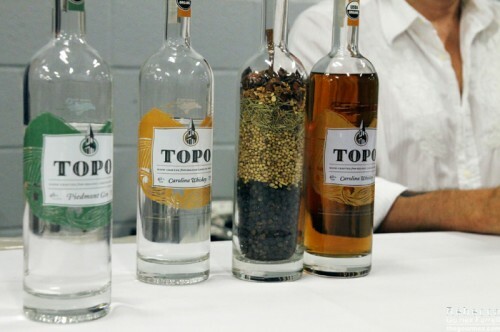 TOPO distils theirs to 92% alcohol on the first run then adds in water and botanicals to the pot still and runs it again, coming out at about 85% alcohol. It has a similar smoothness to the vodka. As I mentioned earlier, I’m often turned off by juniper-heavy gins, so I appreciated the softer qualities of this one a lot, and I could easily see it making its way into my cocktails. 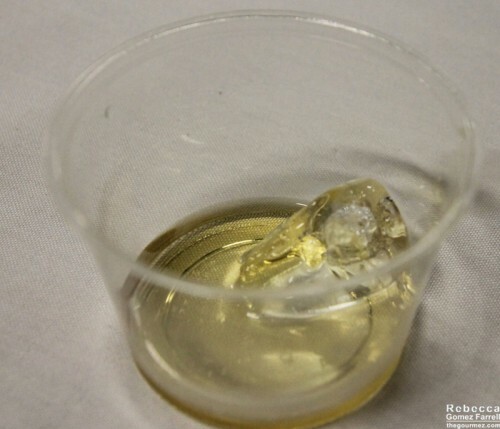 We used a side-by-side comparison for the white whiskey as well, using a top shelf option for the left sample. 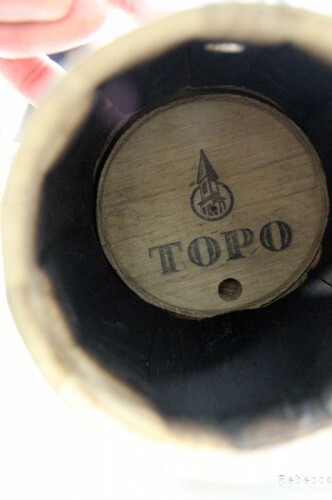 TOPO was the clear winner in this pairing, possessing a much smoother nose and softer flavor on the palate, which we bloggers universally preferred. But there was no mistaking that their three-month-aged whiskey was much, much better, especially with a rock to bring out the flavors. The evening was a lot of fun, as any evening with this crew of food blogging friends tends to be. I had the pleasure of meeting both Tarheel Eater and Sarah Cooks the Book for the first time, and they were both lovely. 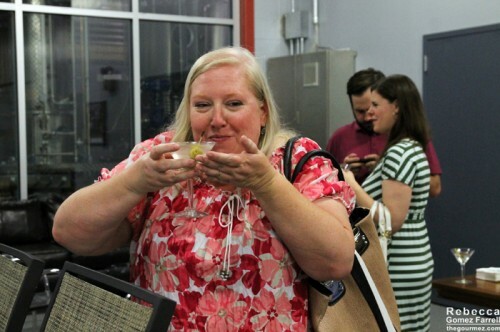 Tarheel Eater’s +1 had the best reactions to tasting the spirits, keeping me entertained. And Esteban and Scott were fantastic hosts. I honestly believe the tour and tasting is worth the normal $10 charge, which was waived for us this evening (Did you just see an obligatory disclaimer? I did!). I’m mostly excited to add some of TOPO’s spirits to my alcohol cabinet! It’s sold at ABC stores in the Triangle, mixed up at several local bars and restaurants, and hopefully will get wider distribution soon. For more pictures from the event, click here. Such a great post. I enjoyed being with you, and I feel that we’re just getting to know each other and now you’re moving. Boo!